Just a quick note for mobile users. To see the full descriptions of massage treatments on your phone simply change the screen orientation from portrait to landscape mode (turn your phone on to its side). it is recommended to book your massage a few days in advance. Traditional Cambodian is a massage without oil. We provide clean and fresh cotton pyjama style clothing to wear. Khmer massage consist of passive stretching and gentle pressure along the body's energy lines to relax the body and mind and ease muscle tension. The Swedish is a gentle no fragrance oil massage. Using a combination of Techniques with sweeping strokes to loosen tight muscles and joints. Drift away with this very popular massage. If you would like it stronger you just have to ask. Stimulate your senses with this soothing oil massage. Using essential oils of your choice. We have no less than twelve different essential oils to choose from. Relaxes muscle, relieves tension and invigorates the body whilst calming the mind. This is a powerful massage concentrating on all those tight spots and Knots that occur after many days of backpacking. It is a massage with a no fragrance oil. You will leave us energized and invigorated. ready for the rest of your travels. A four hand Traditional massage is performed by two therapist working together to give you an unforgettable experience. A truely Cambodian classic. Working on your body's energy lines. A Four hand Swedish massage which is performed by two therapist working together for the ultimate relaxing treatment. Usings a no fragrance oil. A four hand Aromatherapy massage performed by two therapist working together. 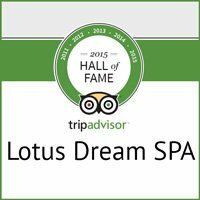 The lotus Dream is a Blissful way to spend an hour or two. A Khmer foot massage is the perfect remedy for your lower leg and foot aches and pains after temple trekking. This is a massage with oil which includes reflexology. our deep tissue is a strong khmer style massage using essential oils. To combine the benefits of stimulating your body's energy lines with the therapeutic properties of your choice of essential oil. Our manicure consist of removing dead skin around nails, neatly trimming cuticles, cutting and shaping your nails. A nail treatment finished with your choice from our many different styles and colours of polish. Our pedicure consist of removing dead skin around nails, neatly trimming cuticles, cutting and shaping your nails. We recommend a foot scrub if you want all the dead skin removed from your feet. A full foot scrub to remove all dead and hard skin. we wash your body then gently apply our green tea body scrub. Allow 30 min for the scrub to be absorbed. We then give you a final scrub before you shower. Would you like to book more then one of our treatments or want to treat someone to a lovely spa package? You will receive a complimentary aromatic tea after your treatment.